IF YOU HAVE AN ALLERGIE, PLEASE TELL US. WE HAVE A SPECIAL MENU AVAILABLE! All our dishes are daily fresh and prepared as much as possible a la minute. Because of this it sometimes happens that one or more of our fine dishes are not available. We kindly ask for your understanding. Please ask for our daily changing specials witch aren’t on the menu. Enjoy your dinner at the Garlic Queen! Garlic Queen serves in addition to coffee and tea, a large wine selection. 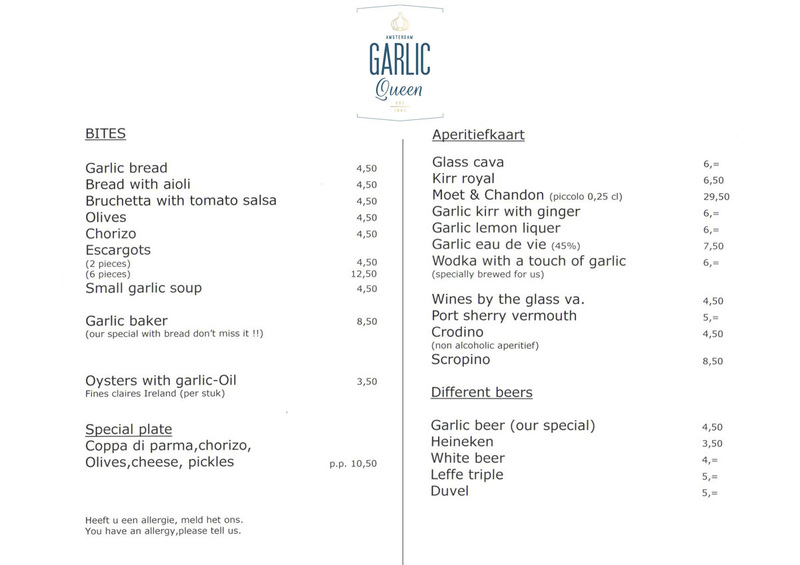 For our garlic lovers, we offer garlic beer, garlic-lime liqueur, vodka with a twist of garlic and Eau de vie with garlic!